As the sun rises on Caprica, Starbuck and Anders discover that the Cylons have vanished. Brother Cavil declares it to be a miracle. But when the rescue team and civilian survivors return to the Galactica, the real reason for their survival become clear: Brother Cavil is a Cylon, his duplicate counseled Tyrol, and he has come here to deliver a message: The "Heroes of the Cylon" (Number Six and Sharon Valerii) have persuaded the Cylon leadership that trying to destroy the humans was an error. From now on the two civilizations will live apart, in peace. Panicked at the thought of Baltar taking control of humanity's fate, Roslin instructs her aide to take all necessary steps to steal the election. The plot, however, is discovered by Lt. Gaeta, and Laura and Adama must choose between denying the will of the people and letting a man they suspect to be a Cylon collaborator take power. For Laura, the question is difficult, but the answer is never in doubt: she and Adama allow their plot to unravel. Baltar wins. As President Baltar is sworn in, his Cylon lover, Gina, enacts a final vengeance against the fleet, detonating a nuclear warhead that destroys the Cloud Nine luxury liner. Despite the tragic loss of several ships, colonization of the planet, dubbed "New Caprica," goes ahead over Adama's objections. - This episode was granted a special 60 minute runtime, which played out across 90 minutes of television. - This episode does not feature a teaser prior to the main title, just a recap. - Survivors, according to the main title: 49550. - Tyrol's union speech is an almost word for word quote of Mario Savio's address during the Free Speech Movement at Berkeley in 1964. - Hera is seen on New Caprica in the same white cradle that Baltar saw in his vision in Kobol's Last Gleaming, Part 2. - New Caprica City's population is 39192. - Boomer's baby has been renamed to Isis. - James Callis stayed up all night and drank so he could look so hungover and damaged when the Cylons confront him in his office. - Tyrol confronting Cally. She doesn't hesitate to forgive him and declares that she loves him. - Cavil showing up on Caprica whilst being visible on Galactica as well; he's a Cylon. - Roslin confronting Baltar about his campaign strategy and then his prior relationship with Six on Caprica. - Starbuck revealing that the Cylon occupation is over and Tyrol realizing Cavil is a Cylon. Cavil's "take me to your leader" line is great. - Cavil: "Would you mind telling me what's going on? I'm not a frakking Cylon, I'm not--" He sees his counterpart. Cavil: "Oh... well... okay then." - Cavil: "There is no god." - Roslin: "Throw them both out the airlock. Let them see if there really is a Cylon god." - Tigh and Dee fixing the election. - Baltar: "Laura Roslin is many things. But she's not corrupt and she's not dishonest." - Gaeta discovering that the election was fixed. - Roslin revealing to Adama that Baltar is working with the Cylons. - Adama: "Do we steal the results of a democratic election or not?" - The fleet jumping to New Caprica. 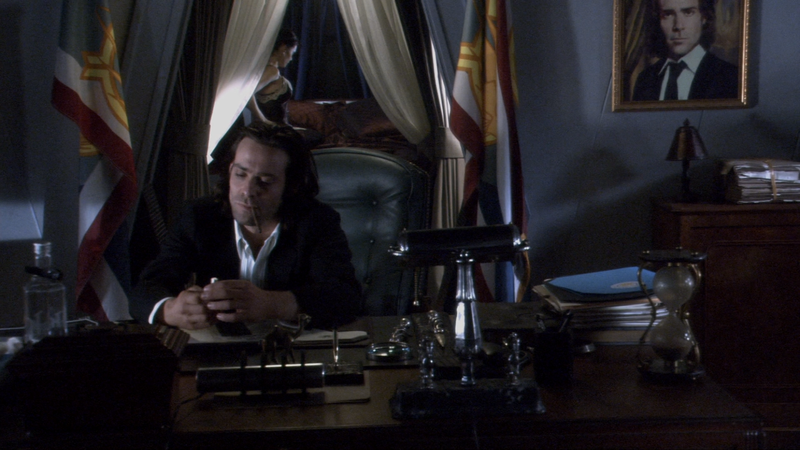 - Baltar's last meeting with Gina. I love how elated he looks. Positively dapper. - Gina finally giving Baltar what he's desired from her since Resurrection Ship, Part 2. - Baltar being inaugurated as president of the twelve colonies. - Cloud 9 exploding in a nuclear blast. - The jump ahead one year. - Adama breaking the filter off his cigarette. There's something charming about that. - Roslin as a teacher again. - The Cylons showing up and the fleet abandoning New Caprica. - The Cylon raiders flying over New Caprica City. - Leoben showing up, asking for Starbuck. - A Doral, Boomer, and Six model confronting Baltar in the presidential office. - The Cylon Centurions marching down New Caprica City. Boomer had an interesting line of foreshadowing in the prior episode. She speculated that "a dark time" was coming, and she was right. Certainly a dark time for the colonials, but what's going on with the Cylons? After the events of Downloaded, and given the events of this episode, could possibly a civil war have erupted within the ranks of the Cylons? What is their plan? Has their plan changed? We get some mixed messages from Cavil. He said that the occupation of the colonies was an error, that the war heroes have managed to swing opinion over to their side, that the Cylons made mistakes, had become corrupt, and needed a new beginning. He said pursuit of the fleet was another error, that Cylon and man will now go their separate ways, and that the Cylons have other plans. But then of course, as soon as the Cylons get lucky enough to stumble on the fleet and their new planet, they take over the place. Was Cavil simply lying to Roslin and Adama, or were the plans and ideologies that he outlined simply overruled eventually? Notably, the Cavil Cylon model claims to be an atheist. Purportedly, the Cavils have been telling the others that there is no god for years. But if the Cavil models and the heroes of the Cylons were responsible for the change in ideology, why does it appear that the war heroes were the ones who greeted Baltar on New Caprica in the ending? We're getting way too many mixed messages from the Cylons in this episode. The election itself was interesting. Do you steal the results of a democratic election to prevent someone who is clearly the wrong choice from becoming president? The moral dilemma was nicely explored. There was great scoring during the election ballot counting scenes as well. Equally great was the scoring when Baltar was inaugurated president and Gina blows up Cloud 9. (Dubbed Something Dark Is Coming on the soundtrack.) Finally, the music played when the one year jump ahead ensued (dubbed One Year Later on the soundtrack) and at the end of the episode was also quite impressive. Gina blowing up Cloud 9 was a bit of a confusing plot point as well. I understand why she did it. Certainly the root cause was her suicidal nature. Maybe there was also a secondary intention to provide the Cylons with a possible way to find New Caprica eventually. But what gets me is why Baltar gave her the damn nuke in the first place. It was a loose thread left over from Epiphanies and now we have our answer. And that answer still doesn't make sense. We have no idea what Baltar thought he was getting out of giving a Cylon a nuclear warhead, but whatever advantage he thought it would bring him, he was clearly wrong. For such an important plot point, it sure wasn't explored very well. That, and it's vaguely ridiculous that nobody thought the Cylons would find that planet, especially after the nuclear explosion. That's just unforgivable. Moreover, why did Adama not attempt to depose Baltar when Cloud 9 was destroyed? He knew the nuke was stolen from Baltar's lab, so the logical thing for Adama to wonder at this point is why the nuke was detonated aboard Cloud 9 instead of Galactica. The only answer is that Baltar gave it away to somebody, since he's the only one who had authorization to do anything with it, and that it didn't fall into Cylon hands until after it was already transported off Galactica. If I were Adama, I'd be very suspicious of Baltar, especially given Roslin's recent admission of having seen Baltar in collusion with Six on Caprica. The last time the President of the Colonies did something fishy (Roslin ordering Starbuck to find the arrow), Adama outright declared martial law. Baltar being responsible for a Cylon setting a nuke off on a ship in the fleet isn't a comparable offense? On top of that, why have no Cylon agents apparently been activated during the one year gap, such as the D'Anna model from Final Cut? Was she inadvertently killed when Gina blew up Cloud 9? Also one year later, Dee is mentioned as a lieutenant, yet is apparently the XO of Pegasus. Not a major problem here, but it seems Apollo ran a pretty loose ship. Is the ship full of nothing but ensigns now? So it's pretty clear by now that as a season finale this episode was rampantly careless, but you'll notice my rating is pretty generous for a remarkably carelessly written episode, so what's so good about it? Well, the Cylon invasion of New Caprica is a fairly obvious but nice parallel the Nazi invasion of France and the fleet's escape is a nice parallel to the Allied evacuation of Dunkirk. Finally, Baltar's surrender a nice parallel to French Marshal Philippe Pétain's surrender to the Nazis. If this trend continues, New Caprica will become a Vichy France and a resistance movement will begin to take shape. This is kind of an enormous cliche, but I like it. More importantly, the jump ahead one year and the Cylon occupation open up all kinds of fun possibilities for how season 3 stories will play out. I have an enormous respect for RDM and David Eick for having the bravery to shake up the premise of the show like this and I hope season 3 pans out as well as I imagine it will. But I must also certainly hope that the stories in season 3 are treated with more care than they were in season 2. There were a lot of technical and continuity goofs in season 2, along with some plot holes and some very important unanswered questions. Most of this stuff was of little importance, but it adds up. And at this point, I think the audience has gotten tired of all these little things that have added up. So while Lay Down Your Burdens is a successful and entertaining pair of episodes, it doesn't compare at all to Kobol's Last Gleaming which just came off as a far more coherent, solid, and moving season finale. I'm still a bit against the very notion that a nuclear warhead would give off a signal to the cylons. Assuming it is a nuke of similar design to our own, a nuclear warhead exploding would give off a signal that's barely audible given the amount of clutter and radiation producing materials in the galaxy. To get a good idea of what I'm trying to say, go out on a lawn, freshly mowed with all the grass cut. The cuts are uneven, some are taller than others, while some are little more than stems half a centimeter above the ground (it was a lousy lawn mower). Now go to a blade of grass and cut off a millimeter of grass. Now walk a few hundred meters in any direction and turn back. Can you tell which blade of grass you cut? Could you even tell the difference? The simple answer's no. The only way it could have given off a signal to the cylons would be if it was in a closed system. Since the galaxy is anything but a closed system, I can't help but call bad science fiction on this one. I'm sure someone can chalk it up to significantly more advanced sensors, but that seems cheap to me.